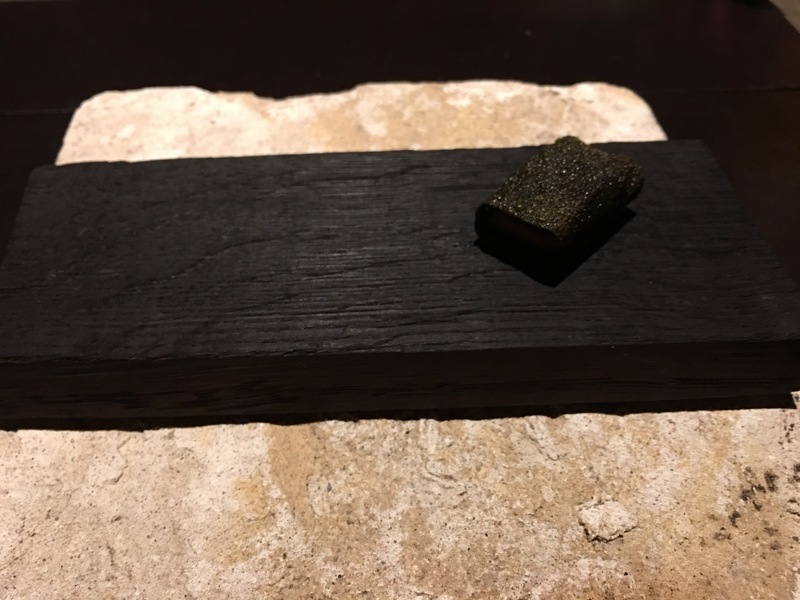 The present photo blog is about my recent dinner at the 3 Star Michelin ‘The Restaurant at Meadowood” located in Napa Valley. I was also fortunate to meet with the Chef Chrisopher Kostow and spend a few minutes with him before the 13 course meal. 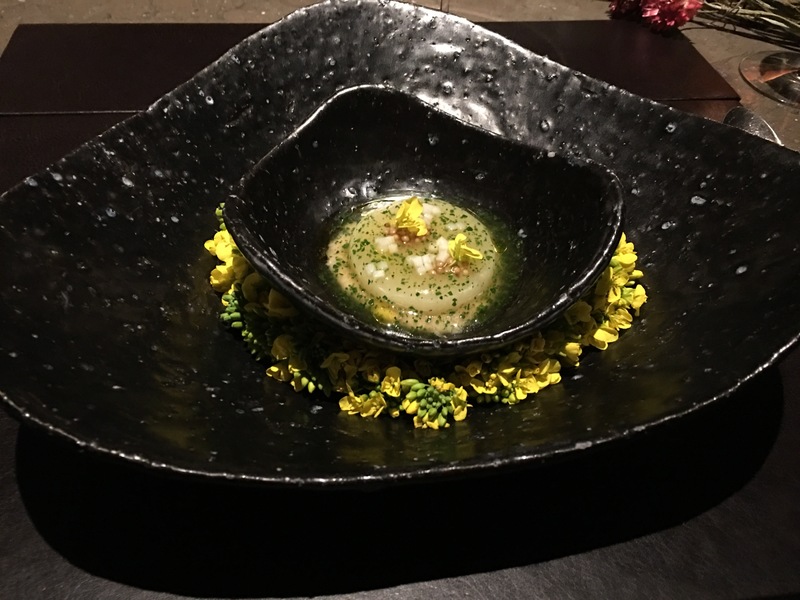 At some point in the very near future, I will be writing a blog on why I am attracted to Modernist Cooking/Molecular Gastronomy. (Tentative titles- Michelin Curd Rice or Pellegrino Pickle Rice). There is something about the intelligence involved in conceptualising a dish by using different creative methods of ‘association’ ‘deconstruction’ ‘adaptation”inspiration’ or experimenting with different techniques for cooking (Ref Ferran Adria), choosing the best ingredients, cooking it to perfection and presenting it like a mixed media painting or a sculpture that makes it a new age conceptual art form that satisfies both your mind and intellect at the same time. In fact its the only form of art that is designed to pleases all the five senses. 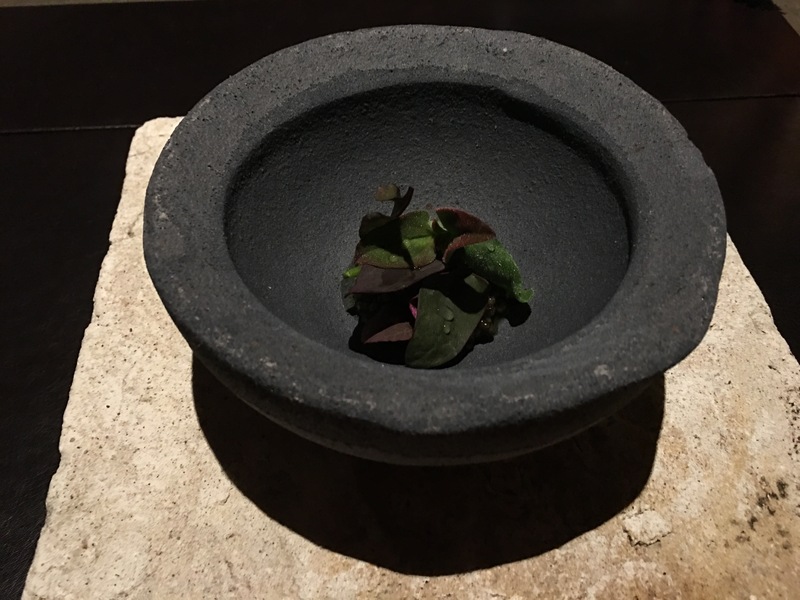 Also the whole experience of a multiple course tasting menu that is conceptualised and curated like a symphony or a Raag, invokes several philosophical thoughts that stay with you beyond the meal for further contemplation. Lastly, its an art form you consume, making it a part of you, again evoking a sense of oneness. More about this in my forthcoming blog on this subject. Here is a brief description about each dish along with the photos. There were five wines that were paired with the meal. Freshwater eel is smoked over cabernet barrels and rolled in grape leaf nori. Dressed with reduced grape saba. Osetra Caviar, from Petrossian, smoked alongside succulents from the garden. Dressed with parsley oil and lemon juice. Succulents vary, but generally include: Red orach, tiny chards, New Zealand spinach, Bull’s Blood beet greens. Yeast rolls are parker house rolls flavored with additional yeast and brushed with yeast butter and sea salt. Whelks are steamed out of their shell and then pressure cooked. A whelk farce is made by binding scallop, cream, egg and whelk. The farce is layered between softly cooked white onion bulbs and brushed with butter. Freshly grated horseradish and horseradish vinegar top the stuffed onions. 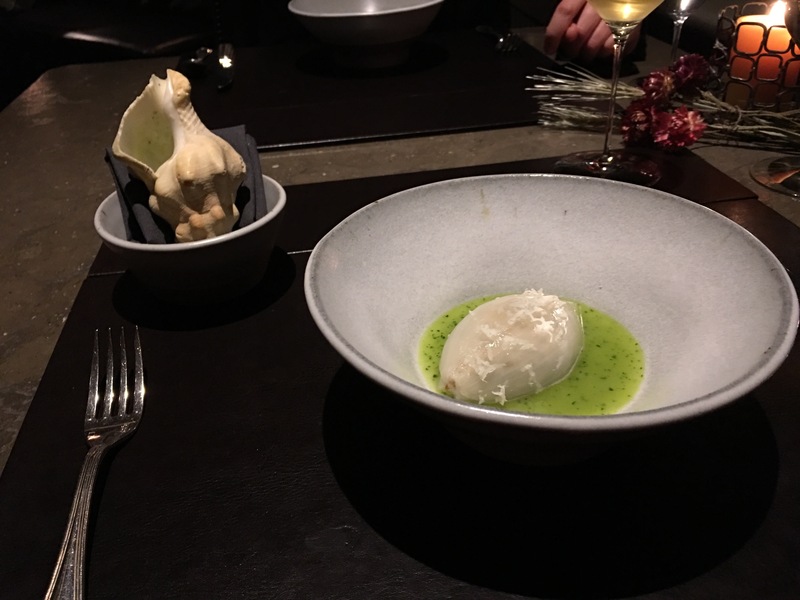 Poured from the whelk shell is the cooking liquid from the whelks and nasturtium butter. Puree of yukon gold potatoes covered with grated, koji-cured foie gras. Pea tendrils and fresh peas, smoked clam stock, citrus kosho, kale & sorrel juice with chardonnay grape seed oil. Rye porridge with soft cooked kohlrabi, which has been glazed with smoked kohlrabi stock, topped with pickled mustard seeds, pickled kohlrabi dice, mustard flowers & mustard oil. 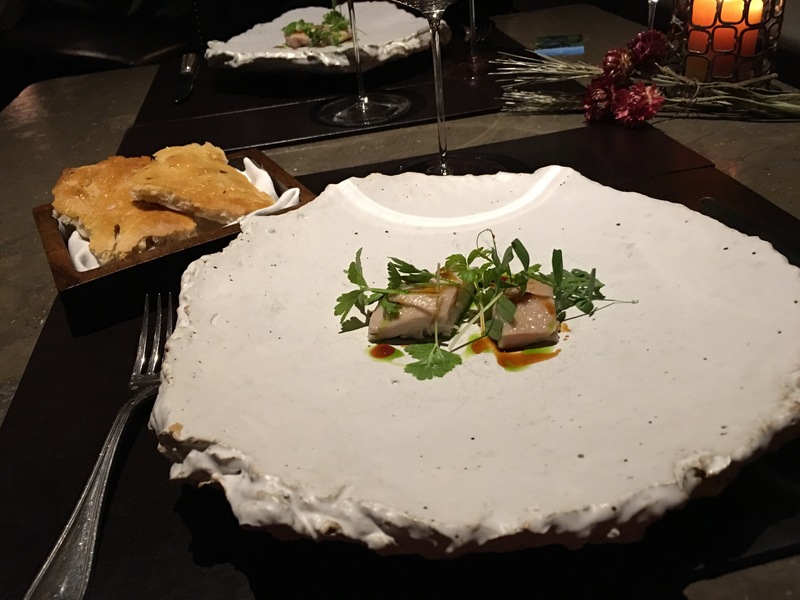 Local black cod, cured and cold smoked, is layered with cod liver mousse and wrapped in savoy cabbage, which is roasted over the coals to char the outside while softening the inner leaves, imparting a smoky flavor. 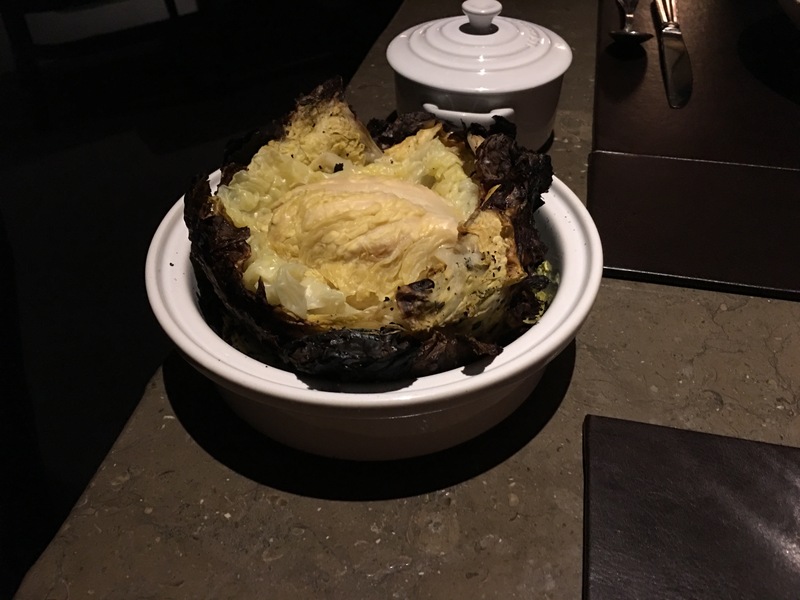 The cod & cabbage is steamed and served inside the charred outer leaves of the cabbage head. 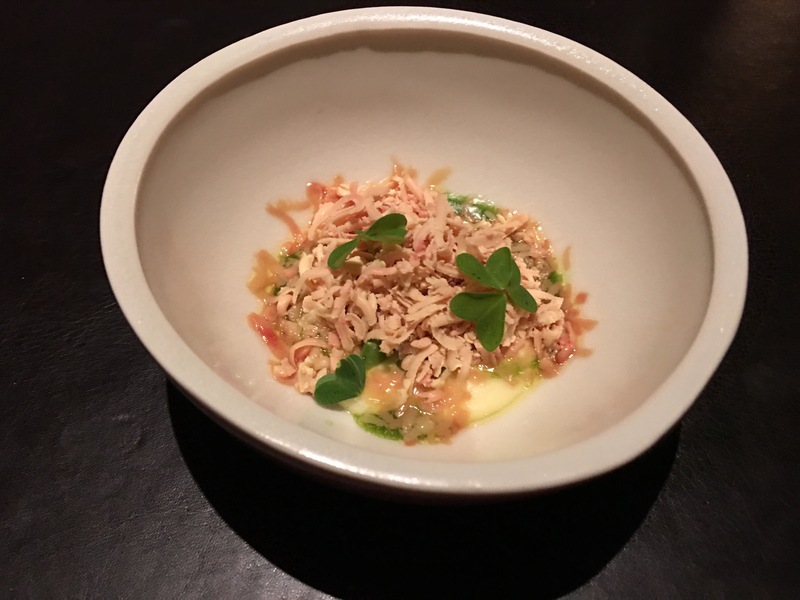 Tableside sauce of reduced whey, butter, oyster, nettles and fermented cabbage juice. Rainbow Trout is salt cured and grilled over binchotan. Served with a fumet, brown butter, lovage oil, and pickled okra seeds. The whole bird is wrapped in sourdough and baked. 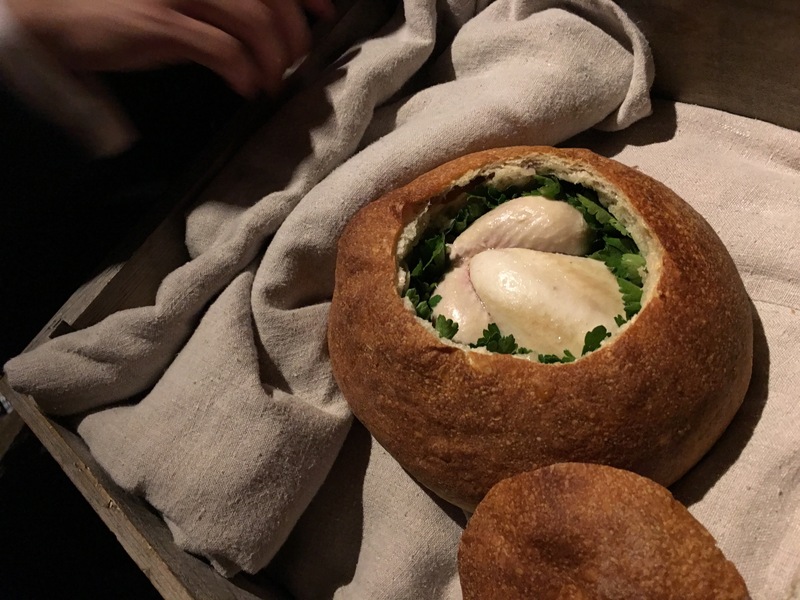 The bird is removed from the bread, which is served first and brushed with poultry fat. On the plate is the breast and thigh of the poussin dressed with a poultry jus, lovage oil, and rendered poussin fat. Garnished with an assortment of tiny celeries, succulents, and greens from the garden and pickled marigold flowers. 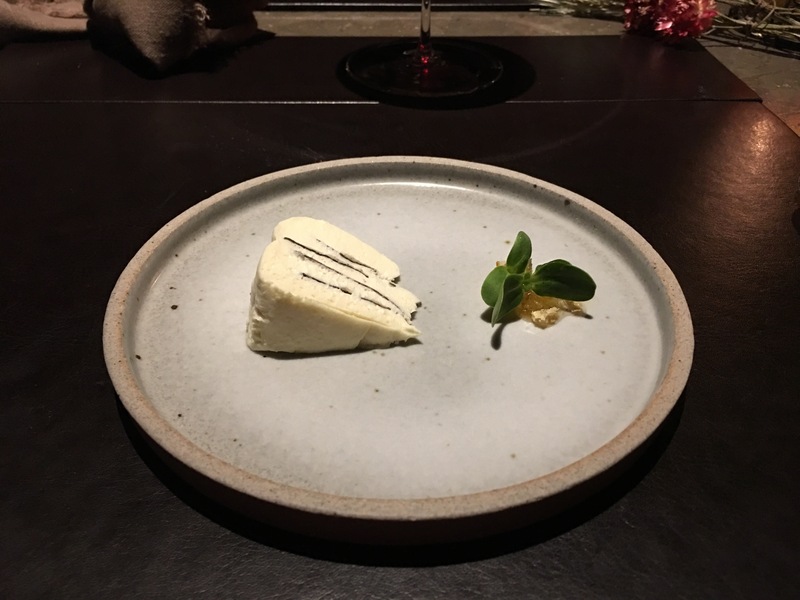 Brillat Savarin, a triple cream cow’s milk cheese that has been layered with black truffles and black truffle butter. On the plate are fresh honeycomb, sunflower sprouts and sunflower oil. It is served with a slice of porridge bread that has been toasted in butter. The bread is made from our whole wheat sourdough starter and cooked brown rice. A pudding of Hudson Ranch olive oil, egg yolks, and soy milk which is frozen to set its’ shape. 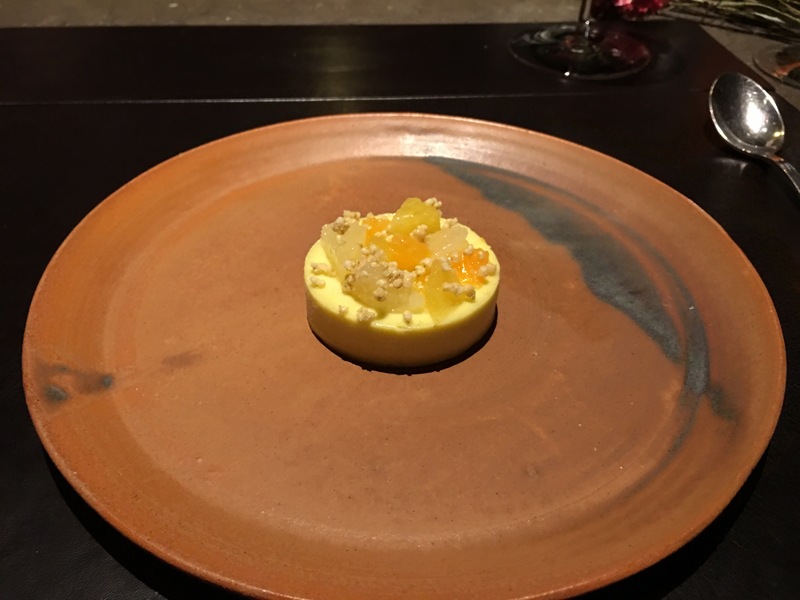 The pudding is topped with seasonal citrus and kumquat jam as well as puffed millet and a drizzle of olive oil. A rice dough or “mochi” is baked to lightly dry it and then sheeted out. The mochi is wrapped around thick pecan butter. Over the mochi are pieces of ripe Hachiya persimmon as well as our hoshigaki. The hoshigaki is hung to dry for about two months using local Hachiya persimmons. Garnished with crushed pecans and a broth made from piloncillo, ginger, and persimmon. Sweet Potato: Cooked in piloncillo syrup, dried, and dusted with black lime. Beets: Candied in blueberry & beet juice and dusted with an elderberry sugar. Grapefruit: The rind candied in its own juice. Yeasted dough, of Eastern European origin rolled in ground cocoa powder, butter and sugar. It is toasted in brown butter and topped with cultured cream, chocolate nougat and a tempered chocolate sheet. 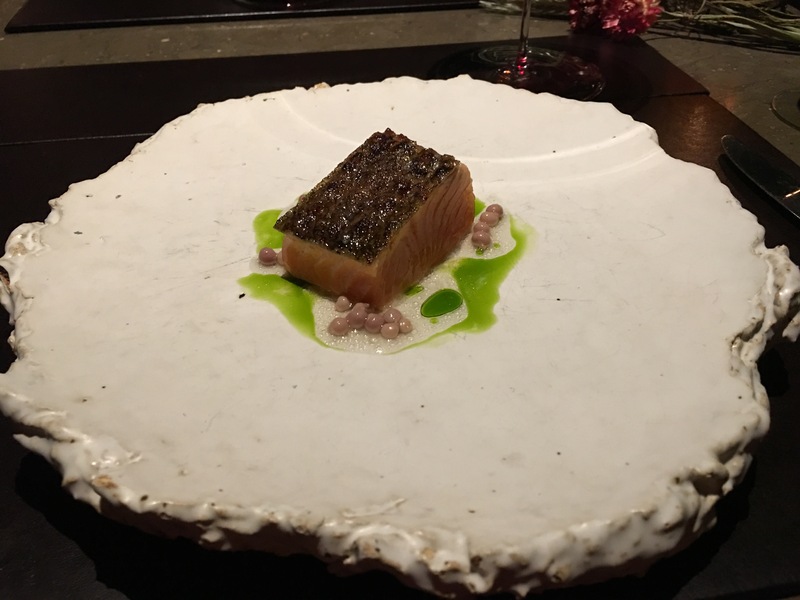 I have been a to a few 1 star Michelin restaurants before and the reason for the three level rating became apparent after eating at Meadowood. The standards of excellence are visibly higher. A Yogi would understand the difficulty nay the superficiality of words to describe some experiences. This was one such experience. Having a meal here can be called a form of transcendental meditation, where you use your senses to transcend them. Awesome review. 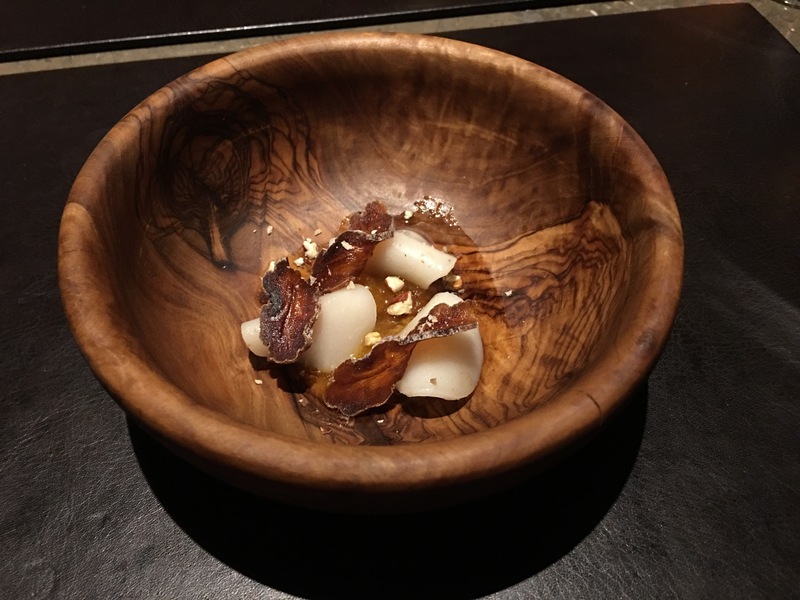 This is one of the 5 Michelin-rated restaurants in California and there are only a dozen or so in the US.